1902 Dan was born in Mokihinui, on the West Coast, where his mother was the local Post Mistress. He was a brilliant student, winning a scholarship to Nelson College from which he matriculated at the young age of 14. He started his teaching career as a pupil teacher at Millerton School aged 15. 1919 Dan attended Teachers Training College in Wellington, and heard coast radio station VLW, Tinakori hill, on the home built receiver he had constructed on the West Coast, but had not heard anything on it down there. 1921 Upon graduating from Teachers College, he joined the Motueka High School, becoming first assistant the following year. In Motueka he built a spark gap transmitter and crystal receiver and eventually managed a QSO between Motueka and Nelson. He also applied for an experimental licence in 1922 but was declined, due to the impending introduction of the Radio Regulations, which were gazetted in 1923. 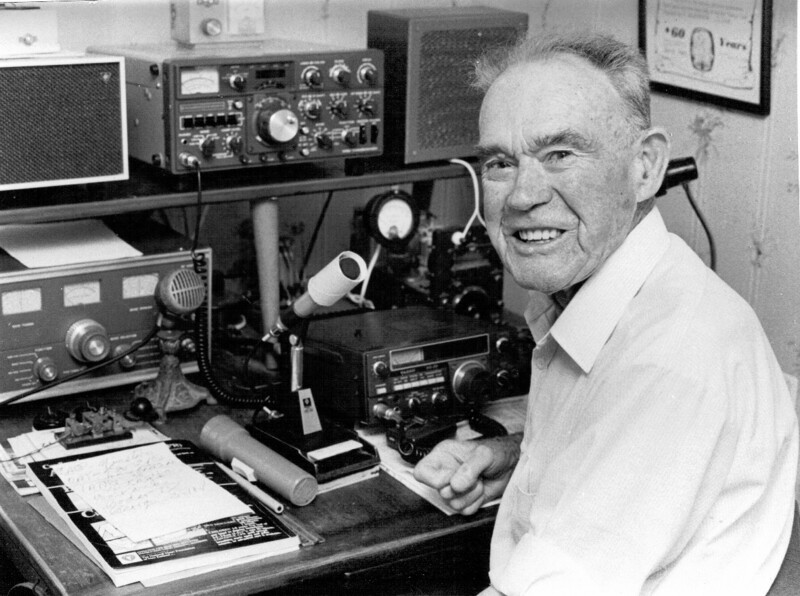 1922 Dan sat and passed his Amateur radio examination and was issued with his licence number 4. 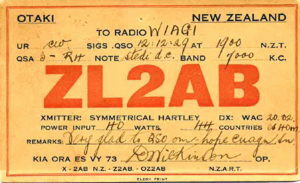 Licences numbers 1, 2 and 3 had been issued to broadcast stations, hence he was the first licenced Amateur in New Zealand.In 1923 valves became available and he constructed an Ediswan 5 Watter transmitter. 1924 Dan has his first DX QSO on 150 metres with VK3HL. 1930 Dan was Vice-Chairman of the Second District and Chairman of the Executive Committee of N.Z.A.R.T. to 1931. 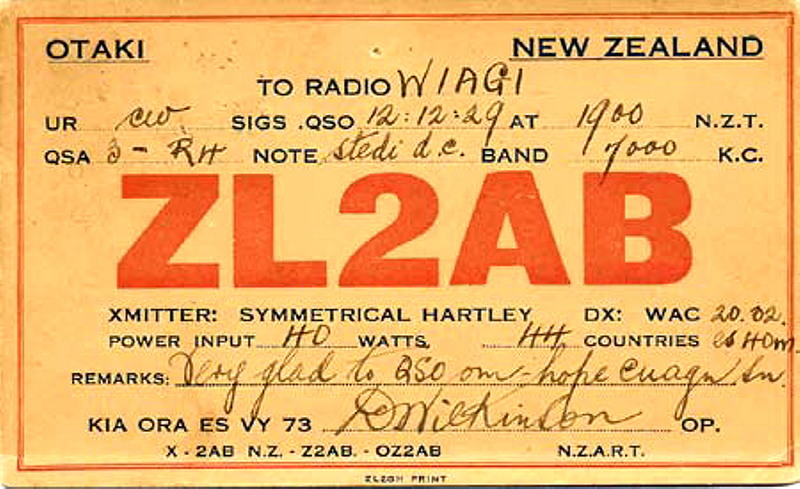 1932 Dan was the President of N.Z.A.R.T. for 1932 and remained on Council for several years after the war. 1939 Dan was Headmaster of Rongiotu School, Manawatu. In 1946 he moved to the Glen Oroua School, Manawatu, and then in 1947 he moved to the Norfolk Road School, Taranaki, where he became the A.R.E.C. section leader. From 1947 until 1952 he was the second District H.F. Permit testing station. 1958 Dan moved to 24 Sanders Avenue, New Plymouth, and retired from teaching after 40 years service. 1978 In February N.Z.A.R.T. Branch 27 made Dan Honorary Vice President for life. 1987 N.Z.A.R.T. made Dan a Life Member of the Association. 1990 Dan was awarded the Q.S.M. 1990 1990 May 6th Dan became a Silent Key.